RAYMOND VAN BARNEVELD overcame a scare before he defeated Katsuya Aiba 6-4 in the first round of the Zipang Casino Japan Darts Masters on Saturday, as the PDC World Series of Darts event enjoyed a spectacular opening in Yokohama. 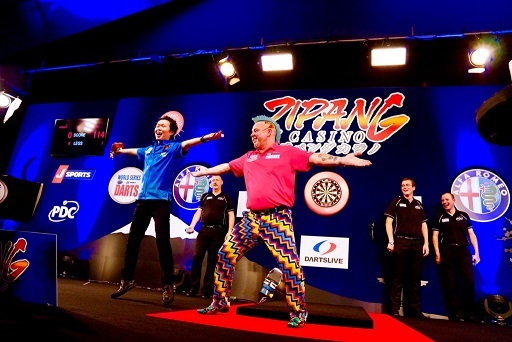 The PDC's first televised event in Japan saw an enthusiastic crowd of over 1,000 pack Yokohama's Osanbashi Hall to see eight leading domestic stars take on the sport's biggest names. 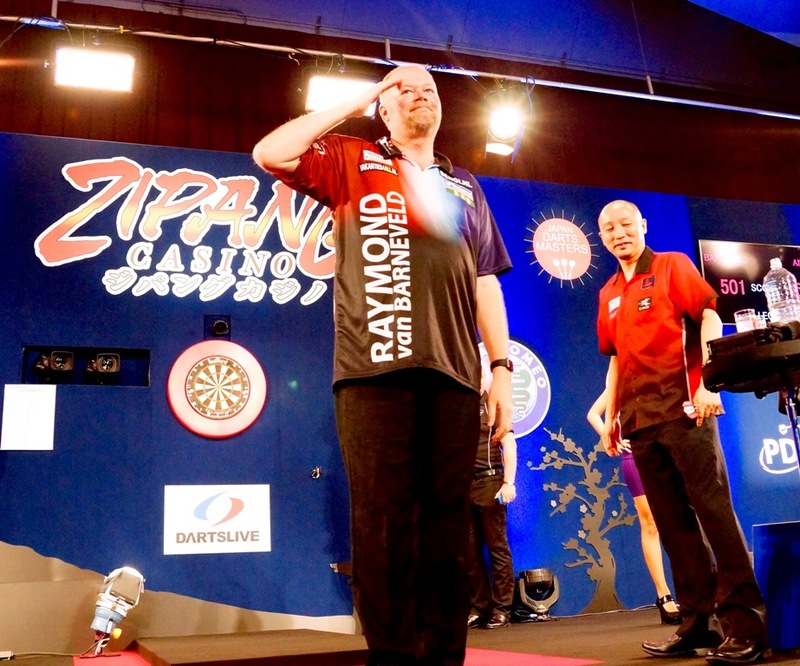 Dutch star van Barneveld was the PDC star who came closest to elimination before he overcame Katsuya Aida 6-4. Van Barneveld began confidently with a 13-dart finish, but Aida led 2-1, 3-2 and 4-3 with some assured finishing - but he crucially missed one dart at double 16 in leg eight to open up a two-leg lead. The five-time World Champion stepped in to follow up an earlier 107 checkout with a 104 finish, before moving 5-4 up on double five and then sealing victory with a 146 combination. "I'm happy with the win but not happy with the way I played," said van Barneveld. "In the first couple of legs everything was fine, but I had a few sloppy legs after that. The three big finishes were important, especially the two at the end, but getting the win was all that mattered and I can prepare for the next day now." Van Barneveld now takes on 16-time World Champion Phil Taylor, who defeated Masumi Chino 6-2 in another game which saw the Japanese ace impress. Taylor landed two 180s as he took the game's first three legs, only for Chino to finish 69 to hit back in the fourth and double ten to pull back to 3-2. Taylor, though, finished 135 to restore his breathing space before winning the next two legs to progress. "It's very nerve-wracking coming up against a player you don't know much about, but he's a fantastic player who'll get better and better," said Taylor. "We've had a wonderful reception from everyone in Japan and it's a tournament that we're all desperate to win tomorrow night." 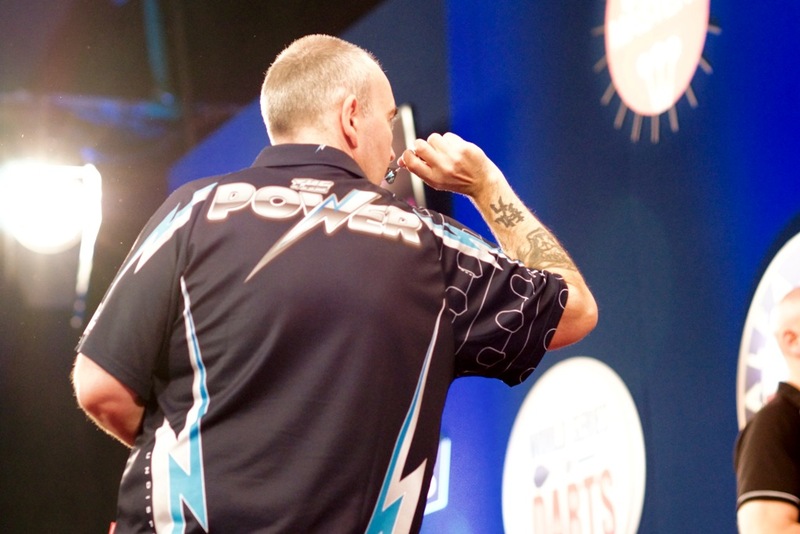 World Champion Gary Anderson landed four 180s in his 6-2 defeat of Yuki Yamada, who took out 121 on the bull but was unable to match the Scot's power scoring. "He played really well and I could see that I was up against a good player when I saw him in the practice room," said Anderson. "It was in the back of my mind that none of us wanted to lose today, so it's a relief. We're all gunning for the title and it's going to be a cracker on Sunday." Anderson will meet James Wade in the quarter-finals on Sunday evening, after the eight-time major winner defeated double World Championship qualifier Morihiro Hashimoto 6-2. Hashimoto hit back from 3-0 down to 3-2 at one stage, but Wade finished double 12, tops and double ten to seal his place in the last eight. "I don't think Morihiro produced the darts he can do but I did enough to win tonight," said Wade. "I'm looking forward to the final day because the crowd were fantastic and they enjoyed themselves." World number one Michael van Gerwen, who won the Dubai Duty Free Darts Masters a month ago, began his bid to win another World Series title with a 13-minute whitewash of Chikara Fujimori. "It's a comfortable win and though it wasn't my best game I'm still in the tournament and still going, so you can't ask for any more than that," said van Gerwen. "I feel good and I'm playing well, but I've got more in my pocket and I'll have to show that on Sunday. I won the last World Series event in Dubai and I'd love to win this too." Van Gerwen's quarter-final opponent will be Stephen Bunting, who hit six doubles from eight attempts in a clinical 6-1 win over Shintaro Inoue, whose only leg came with a 118 checkout. "I don't think the scoreline reflected the game because he missed some doubles to go ahead and it could have been a different game if he had hit them," admitted Bunting. "He showed what a fantastic player he is but he missed a few doubles early on, and six out of eight for me is probably as well as I've finished all year." Adrian Lewis swept past Sho Katsumi with a 6-0 whitewash to begin his bid for a first World Series of Darts victory. "He beat me in the World Cup a couple of years ago so I owed him one, but it was going to be tough for him in front of his home crowd," said Lewis. "It wasn't a great game but I got the job done, and as long as you win then you know you can improve your performance. If I want to win the tournament then I've got to be on my best form on Sunday but I'm feeling good." Lewis will now take on Peter Wright, who ended home hopes in the tournament with a 6-1 defeat of Japanese number one Haruki Muramatsu, averaging 102.28 in the best-quality performance of the first round. Wright landed two 11-darters as he took a 3-0 lead, before Muramatsu took out 100 to hit back, but the colourful former World Championship finalist pulled clear by taking the next three legs without reply. "I knew that I was up against the top Japanese player and the amazing venue and great crowd spurred me on," said Wright. "It was hard being on last after everyone else had played, and won, so there was more pressure on me and it's a relief to get the win. I still feel that I've got more in the tank, but I really enjoyed the game. It's going to be tough on Sunday with three games but I can't wait."